Today Jessica is a happy and confident teenager who enjoys sleepovers with her friends, participating in church activities, and camping with her family. But when I first met Jessica last year, she was becoming more withdrawn, not wanting to even spend the night at her best friend’s house. She was afraid to try new things and her self-confidence was rapidly decreasing. Academically she was struggling. Her mom, Patty, found Jessica was very inconsistent with her school work. Some days it seemed she understood a concept then the next day it was as if she was learning it all over again. She avoided reading, and noticed when she did read, the words were blurry so she often compensated by closing an eye. She was working so hard to read, it’s no wonder she struggled with reading comprehension! Jessica began a vision therapy program and within a number of weeks she had less resistance to reading and stopped asking, “How many more pages do I need to read?” By the halfway point in her vision therapy program other family members and friends were starting to take notice that Jessica seemed more confident; standing taller, making better eye contact, and able to converse more naturally. Jessica was starting to take notice too. Everyday skills such as wiping off the table, folding laundry, cutting with scissors, and tying her shoes were easier. She even became better and more confident steering her bike. Patty saw an increase in her reading level, neater handwriting and spacing, and better communication from Jessica. She was now able to express when she was frustrated with things instead of just shutting down. Her overall body balance and coordination was improving. 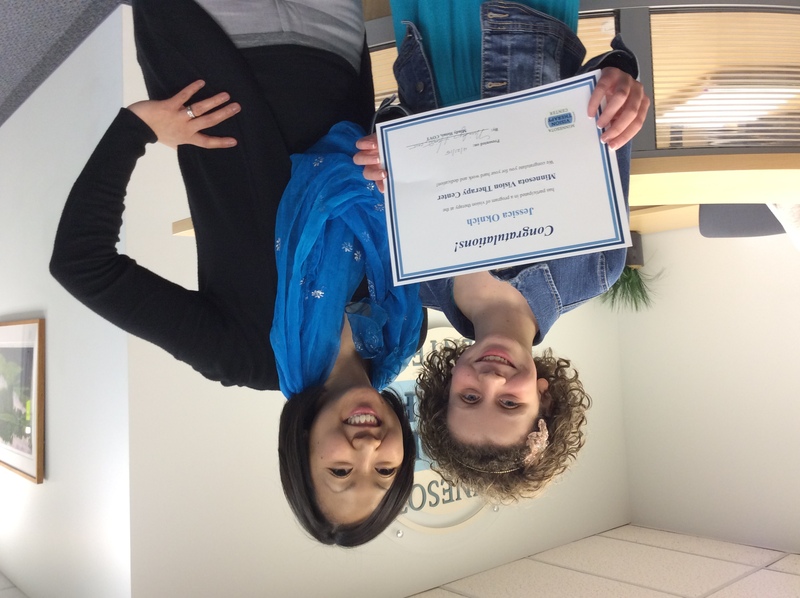 By the end of her vision therapy program Jessica was well on her way to catching up in her academics. She now had all the “ingredients” to complete her “recipe” for success – better eye teaming and tracking, improved visual perceptual skills, better integration of her senses, plus she now had the increased confidence to apply and use these skills. 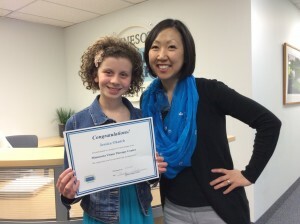 Jessica’s road to success consisted of a lot of hard work as well as support and help from her family. But the smile on her face, and the happiness and confidence that radiate from her now means all of her hard work was worth every moment! “Well I really think I’ve been more confident of my handwritting and reading is way easier than before vision therapy. I used to stutter when I read but now…now I don’t stutter. It’s just so amazing how God put this change into my life. Even changing diappers and wiping down a table is easier than it was. Vision therapy has changed my life so much. I also couldn’t steer my bike that well and now I can steer really good. I think vision therapy has helped me so much. Even folding laundry and unloading the dishwasher is easier because my hands use to shake while doing it. But I don’t do that anymore. Reading, when I’m reading I can hear my silent voice, I never could before. ← What Visual Skills are Necessary for Successful Learning?